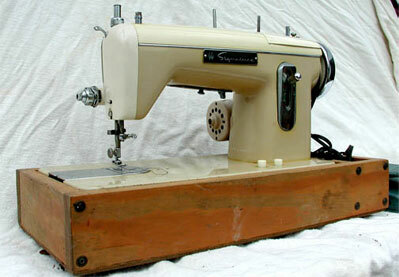 Pictured above is our really nice Montgomery Ward sewing machine. It is made in Japan and obviously has the same degree of quality as their good automobiles. We bought it at a great outdoor flea market in York, PA for the huge sum of $5.00 in 2006. It is one of Jim's favorite machines. It is in like-new condition as seen in the picture. Perhaps we should have removed the blue tape before we took the photo, but the machine was in use and the tape was marking a seam allowance. The machine is all metal, very heavy and smooth running. It also has a built-in adjustable zigzag feature controlled by the two sliding levers on the top side. The operation of the forward/reverse lever may be backwards to some people. 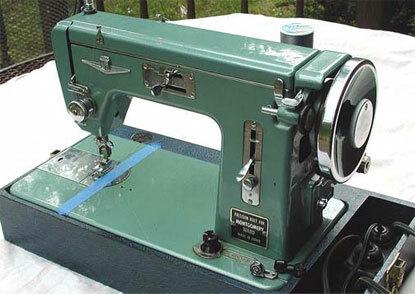 SN 750099, Sewing head model URR-785 also has SN 55X; Portable Case Model No. URR-100. This machine is is unusual in our collection as it appears to have many bronze parts on the exterior (see faceplates under the controls) and the entire mechanism appears to be made of bronze. It is a zig-zag machine that also has removable disks to make a few other stitch patterns. There are several similarities in the machine shown at the top of the page and this tan machine. 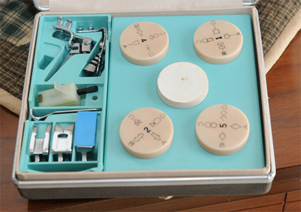 The machine came with a nice accessory box that contained cams or disks, feet, and other accessories. The disks are inserted into a round hole in the machine's top. The original box probably contained five fragile disks. The moving parts of this Montgomery Ward machine appear to be made of bronze. The parts are free of corrosion and they are attractive.. 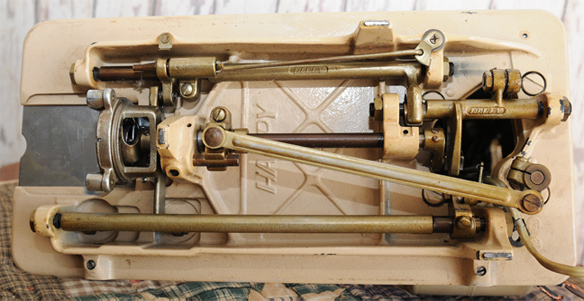 The bobbin case and hook are a few of the parts which are not bronze-colored. 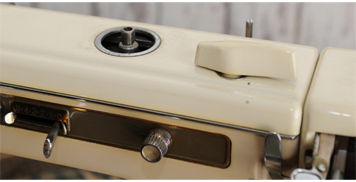 Note the vertical bobbin accessible through a small slide plate. When our very nice neighbor lady passed away, her son gave this Montgomery Ward Signature sewing machine to us. It was her mother's machine. We assume that the family woodworker made the base it is installed in. 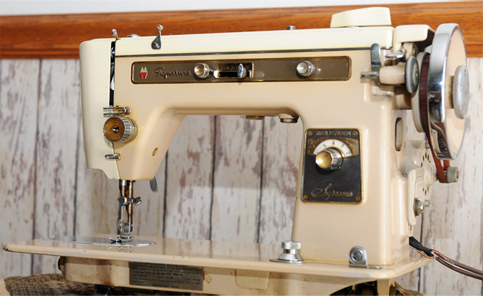 It is a straight stitch machine. When we first plugged her in, the fire flew and the lights went out. A brittle lamp cord wiring from the motor to the duplex outlet had shorted and tripped the house circuit breaker. This project is currently on hold. It was also a lesson to carefully inspect all wiring of a machine before plugging it in. Sewing Head Model No. URR-251A Serial No. 55X. The number JA3511180 is also hand-stamped on the head.